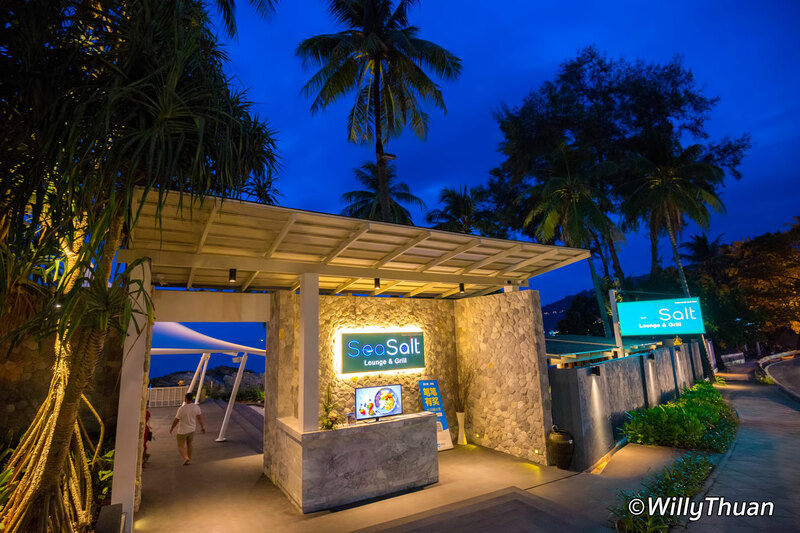 Sea Salt Lounge and Grill is a beautiful new restaurant as well as a lounge built on a prime seafront location in Patong Beach. SeaSalt is also part of the well-known Diamond Cliff Resort. 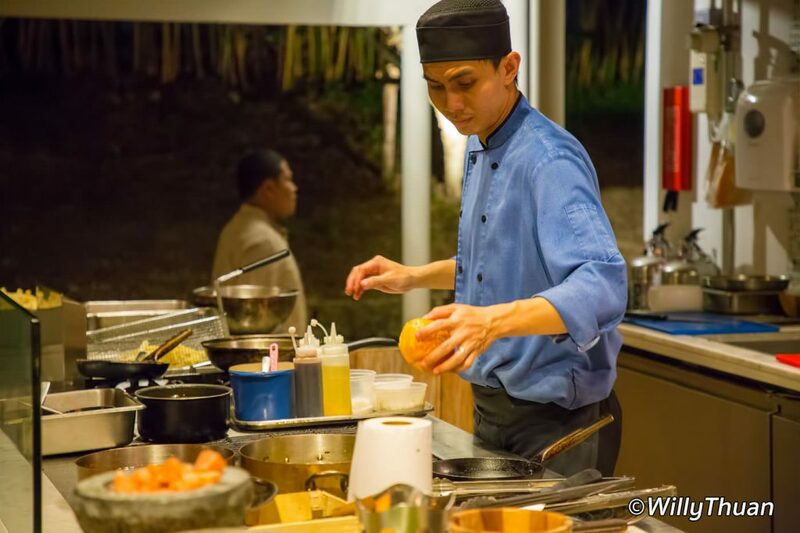 If you are a little familiar with Patong beach, Sea Salt is just next to Da Maurizio, Joe’s Downstairs and Baan Rim Pa set of restaurants, just outside Patong Beach on the way to Kalim Beach and Kamala Beach. 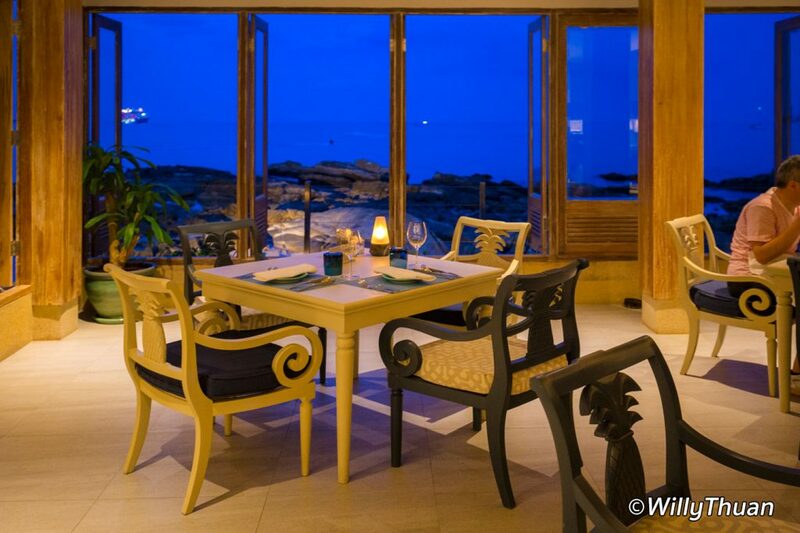 Sea Salt Restaurant and Lounge is divided into two areas: the lounge and the restaurant itself. The main entrance by the road is large and beautifully designed, but if you came by car, you might start worrying. There is no way you can find any parking spot nearby! But here is a tip: park at the Diamond Cliff Resort just across the street. Sea Salt Lounge and Grill is part of the resort, and the security is very friendly once you told them where you are going. Once you crossed back the bustling street, someone will welcome you at the entrance and walk you to the lounge. 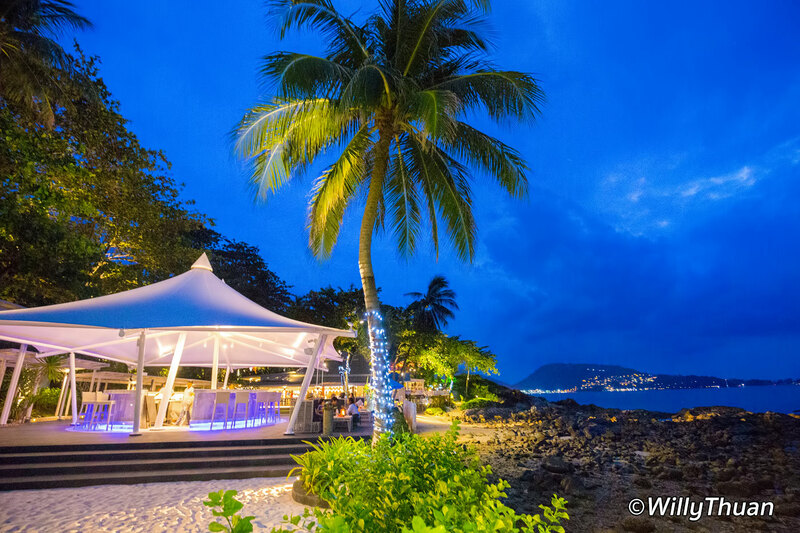 The lounge is a circular bar lit under what is now a signature awning white roof of Phuket beach bars. The bar is surrounded by comfortable ‘Salas’ and sofas set on artificial grass on one side, and an artificial beach on the other. If you are lucky, you might even get some of these very popular sofas surrounded by water (see photo below). They looked tempting and exotic, but they seemed a little too deep to our taste, making it difficult to enjoy the sea view just next to it. 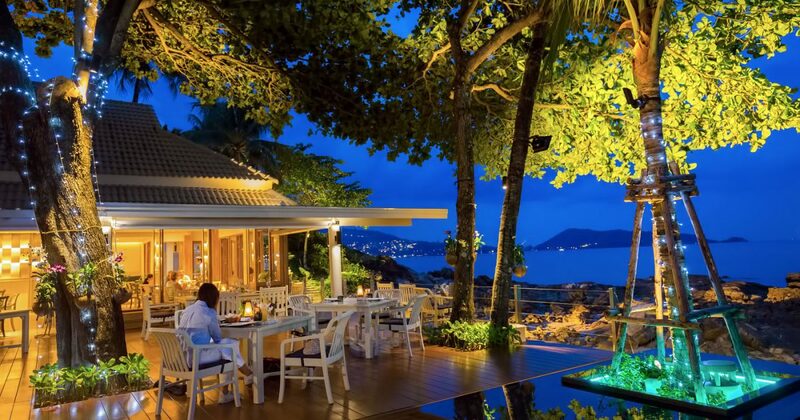 Sea Salt Lounge is a great place to enjoy cocktails with music while admiring the sunset over the sea. Once done with your evening drinks, it’s time to move to the dining table you were smart enough to reserve as soon as you walked in, or even book in advance at 076 623 555 as the place seems to be getting popular. The restaurant area is beautifully designed, with an indoor and an outdoor section. The outdoor area set under tall trees was the most appealing to us, and we sat just next to the sea. It was lovely. The menu is quite extensive with a mix of seafood and meats grilled on charcoal. We started with Taiwanese Popcorn Chicken (250 baht), and these were very nice with a local beer (140 baht) and a cocktail (270 baht). To give you an idea of the drinks price range, a Coke is 100 baht and a Perrier 140 baht. 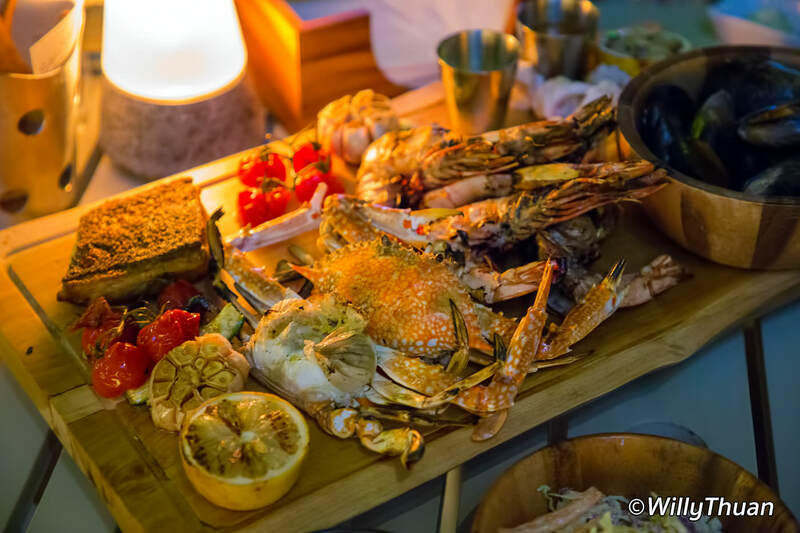 We then ordered their big seafood platter (3,350 baht + taxes) that included big prawns, imported lobsters, blue crabs, squid, grilled fish and mussels. That dish was a hit and miss. Fish and squid were perfectly cooked, but mussels were under-cooked, and lobster had that watery texture of frozen seafood. Next time we’ll probably go for the meat, maybe a Tomahawk at 2,950 baht. The indoor is also very welcoming with all the glass windows opened on the sea to allow the breeze to flow through the room. The seating is very comfortable, and the lounge music is more discreet in that area, in case you like it quieter. 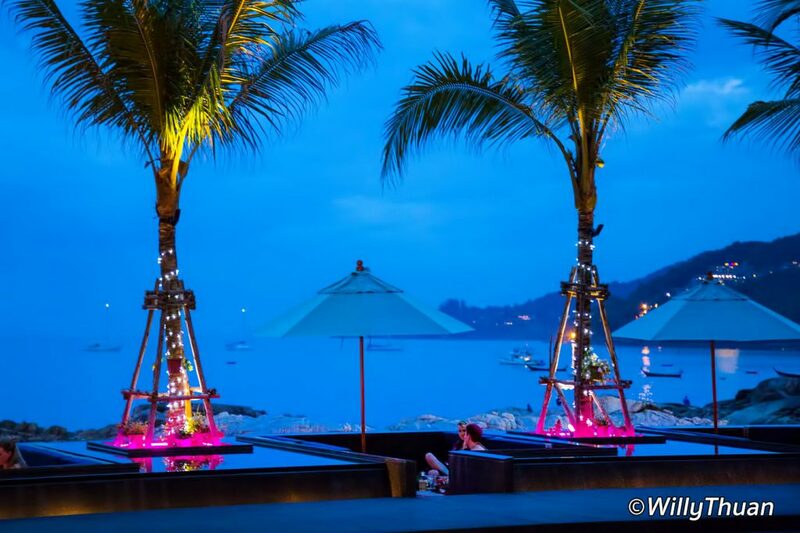 Overall, Sea Salt Lounge and Grill is a good experience in a beautiful setting and very close to Patong Beach. Prices are on the high side, but the location, the atmosphere, the drink and the amiable team made the evening a success.